Yesterday, Attorney General William Barr released a four-page summary of the final report he received from special counsel Robert Mueller. In his summary, Barr said that the Russians definitely interfered with the election in two ways, but that neither Donald Trump nor his campaign aided with the interference. This is certainly good news for Trump, probably much better news than he expected. Mueller's report also addressed the issue of whether Trump obstructed justice by trying to stop the investigation—for example, by firing then-FBI Directory James Comey and then telling NBC's Lester Holt that he did it to stop the Russia investigation. Mueller didn't come to any conclusion on that issue, but Barr and Deputy Attorney General Rod Rosenstein have concluded that he didn't. As to the Russian interference in the election, Mueller found that the Russians did two things to try to swing the election to Trump. First, they set up a troll farm known as the Internet Research Agency to make a very large number of pro-Trump postings and comments on social media and regular media websites. Second, they hacked and then released e-mail from Hillary Clinton's campaign and the DNC with the intention of hurting Clinton, which it definitely did. Both of these activities are crimes and the main perpetrators were indicted, but since they are all Russians, none of them are likely to ever see the inside of a U.S. courtroom, let alone a prison. In retrospect, the conclusion that the Russians didn't get a lot of help from Trump is not entirely surprising. Russian President Vladimir Putin never liked Hillary Clinton and realized from the beginning that she would be impossible to push around, whereas Trump would be an easy mark. So there was never any doubt in his mind on which team he was. Putin and his associates probably also realized from the start that they didn't need Trump to tell them which states were swing states and which demographic groups were potentially persuadable. All they had to do was buy a subscription to The New York Times or the Washington Post. And if they wanted to save their rubles for buying ads on Facebook, they could just have read Politico and The Hill, which are free. But Barr's report on Mueller's report isn't the end of the story. It is merely the start of the second act. The Democrats, led by House Intelligence Committee Chairman Adam Schiff (D-CA), are going to demand (and sue) to get Mueller's full report and all the evidence backing up its conclusions. That battle will take months, maybe years. It will certainly end up in the Supreme Court, which is unlikely to want to make a decision just before the 2020 elections, so if the case makes it that far in the summer of 2020, the Court could conceivably punt and not deliver a ruling until after the election. As far as impeachment goes, this is going to put a serious damper on it. Speaker Nancy Pelosi (D-CA) has said that an impeachment should go forward only if there is clear bipartisan support for it. With this report, few, if any, Republicans will support impeachment. House Democrats could do it on their own, but there is zero chance that 20 Republican senators will vote to convict unless a lot more damaging evidence comes out. Of course, House Democrats are going to investigate Trump six ways to Sunday, so more might come out, but as it stands now, impeachment is off the table for the moment. While the battle to get Mueller's full report and all the supporting evidence is going on in the courts, the House Democrats are probably going to subpoena Mueller and members of his team to see what they can find out by asking questions like: "Did you find any evidence that Trump obstructed justice?" So far, we know little about what the other members of Mueller's team think. It is entirely possible that Mueller didn't think there was enough evidence to warrant a clear finding of obstruction, but other members of the team disagreed, and might be willing to tell Congress if asked. Hush Money: If the payments Trump made to Stormy Daniels and Karen McDougal were intended to buy their silence, they are illegal and unreported campaign contributions. This is currently under investigation by the Southern District of New York (SDNY). The office is headed by a Trump appointee, Geoffrey Berman, but Berman has recused himself, so his deputy Audrey Strauss is running the investigation (having just taken over from Robert Khuzami). Inaugural Committee: SDNY and other federal offices are looking into the payments made to Trump's inaugural committee and also into where the money went. The committee raised an unprecedented $107 million, some of which may have been donated by "straw donors" in order to conceal the real donors, who may have been foreigners. Foreign donations to an inaugural committee are illegal. But even some of the American donations may be suspicious, if they were effectively bribes for some later action the donor wanted. Where the money went is also of interest to investigators. Almost half the money went to just two firms involved in "event production," one of which is run by a former advisor to Melania Trump. Tens of millions more are unaccounted for. Trump may be in real danger here because the deputy chairman of the inaugural committee was Rick Gates, who is singing like a canary. Congress: Half a dozen House committees are looking into all manner of things Trump, and all have subpoena power. Among other topics they are curious about are Trump's tax returns, Jared Kushner's security clearance, Trump's dealings with Deutsche Bank, and, of course, the Russian interference in the 2016 election. New York State: New York Attorney General Letitia James (D) and other New York officials are looking into Trump's foundation, which he used as a slush fund and for self-dealing, in violation of state laws regulating charities. State officials are also looking at how he valued his property. For insurance purposes, he inflated it, but for property-tax purposes, he deflated it. He tried to have it both ways and there are plenty of paper trails here. James has also issued subpoenas to Deutsche Bank and Investors Bank to get a better handle on Trump's finances and any financial crimes (e.g., money laundering) he may have committed. Lawsuits: Multiple lawsuits against Trump are in full swing, and the discovery process associated with them could turn up all kinds of information the President would prefer to keep hidden. Summer Zervos has sued Trump for defamation and her lawyer wants to depose Trump under oath. Under similar circumstances, Bill Clinton was deposed under oath, lied, and was impeached for perjury. Trump's lawyers are fighting the deposition on technical grounds, saying presidents can be deposed only in federal courts, not state courts. The state of Maryland and the District of Columbia are suing Trump for violating the Constitution's emoluments clause. The discovery process could allow the two AGs to subpoena all manner of the Trump Organization's financial records. However, a ruling by a lower-court judge was heard by the Fourth Circuit last week and the judges didn't seem impressed with the plaintiff's arguments. The Democratic Party has no shortage of rising stars running for president. That means sooner or later they will collide. Turns out, it is sooner rather than later. In particular, Sen. Kamala Harris (D-CA) and Beto O'Rourke both want to be this cycle's Sen. Bernie Sanders (I-VT) and each one realizes the other one is in the way. They aren't verbally attacking each other, but they are definitely encroaching on each other's turf. This past weekend, Harris was in Texas (Harris County, naturally) stumping. She clearly isn't conceding Texas, which votes on Super Tuesday, along with California and eight other states. Harris understands that while Texas is still a red state, black and Latino voters make up a large piece of the Democratic primary electorate there, so there may be plenty of delegates to be scooped up. In fact, it might actually be easier for a Democrat to move the delegate needle in a red state than a blue state, because it requires fewer votes and because some Democrats tend to overlook the red states. Bernie Sanders used this insight to great effect in 2016. Meanwhile, O'Rourke is eyeing South Carolina, a state whose primary Harris is counting on winning (or coming in second) because about half the Democratic primary voters are black, and she and Sen. Cory Booker (D-NJ) are the only black candidates. Undeterred, however, O'Rourke gave a speech at South Carolina State University and met with some prominent black leaders there. He talked about the economy, education, and health care, topics certainly of interest to black voters. Sen. Kirsten Gillibrand (D-NY) lit into Donald Trump yesterday in her first campaign speech as an official candidate for the Democratic nomination for president. She gave a fiery speech in front of the Trump International Hotel and Tower in New York yesterday. Most of the other Democrats have gone easy on Trump so far, so Gillibrand, who is polling at 1%, went for broke. Nature (and politicians) abhor a vacuum, so she said: "President Trump is tearing apart the moral fabric of this country," adding "Our president is a coward." 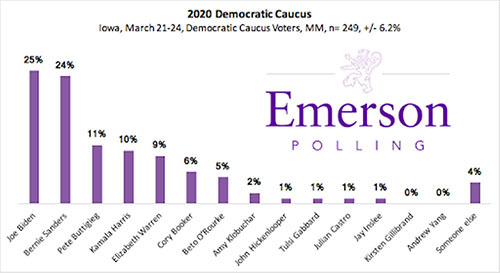 A new Emerson poll of Iowa has Joe Biden leading with 25% and Bernie Sanders just behind at 24%. Surprisingly, number 3 is Pete Buttigieg, who previously was at roughly 0% and is now at 11%. In addition to the 7.5 years of prison former Trump campaign manager Paul Manafort got for bank fraud and various other crimes, he also forfeited $11 million to the federal government. Ever the wheeler-dealer, Manafort may have come up with a scheme to hang onto some of the cash, despite the forfeiture. The core idea here is that if Manafort had valid debts outstanding, they will be paid out of the forfeited funds, to prevent the creditors from being punished for crimes they didn't commit. A mysterious shell company, Woodlawn LLC, with unknown owners, is claiming in court that Manafort owes it $1 million on a mortgage and wants to be paid out of the forfeited funds. Prosecutors suspect Manafort may own Woodlawn, so if they pay the company, Manafort would de facto get to keep the money. There are a number of states in which the Republicans control the legislature and some Democrat holds a high position in the state, so the temptation for the legislators to strip the Democrat of his or her authority while they can is overwhelming. We have seen this in North Carolina, where Republican legislators have greatly reduced the power of Gov. Roy Cooper (D-NC) and in Wisconsin, where the Republicans used a lame-duck session to hamstring incoming Gov. Tony Evers (D-WI) just as former governor Scott Walker (R) was exiting. The courts are looking at these cases and in Wisconsin, at least, may block the laws. They have already struck down dozens of Walker's midnight appointments. Now Kentucky is following the Wisconsin and North Carolina playbook. The state legislature passed a bill stripping Secretary of State Alison Lundergan Grimes of her power over the Board of Elections, including removing her as chair, although she will remain a nonvoting member. Gov. Matt Bevins (R-KY) has said he will sign the bill. In Nov. 2018, Florida voters approved a ballot measure (Amendment 4) that would allow over a million former felons who have served their time to be reenfranchised. However, many former felons are black and thus are likely to vote for Democrats in 2020. The Republican-controlled state legislature sees this as a problem that needs to be solved. A state House committee is already hard at work on it. It just passed a bill that would make it harder for the former felons to vote, despite the passage of Amendment 4. In the House bill, ex-felons could only get their vote back after they had paid all court fees and costs arising from their convictions. Many ex-felons are poor (not a lot of high-paying jobs in Florida prisons) and cannot pay the fees, so if the bill passes, they won't be able to vote in 2020. Programming note: We're going to move the Q&A to Tuesday, to give extra time for any Mueller report-related questions.